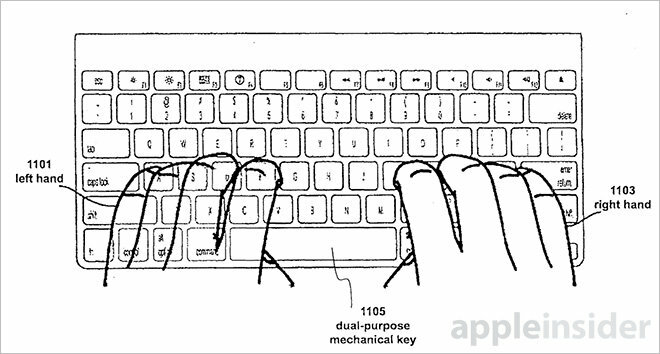 Apple on Tuesday was granted a patent describing a dual-purpose keyboard that sports touch sensors overlaid atop mechanical keys depressible to two more levels, affording users both multitouch gesture control and conventional keystroke entry without having to remove their hands from the device. As published by the U.S. Patent and Trademark Office, Apple's U.S. Patent No. 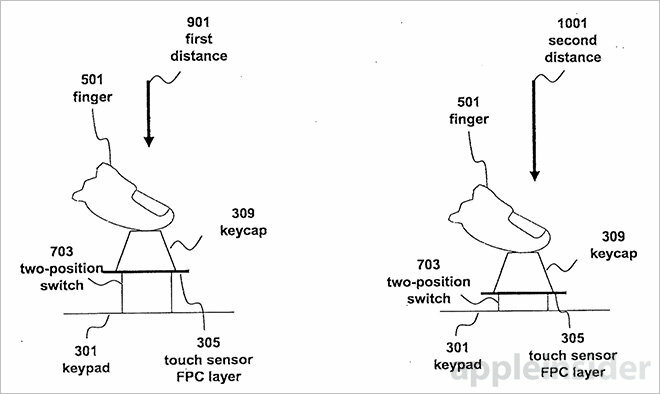 9,041,652 for a "Fusion keyboard" details a device outfitted with capacitive touch sensors and depressible mechanical keys featuring multi-stage switches. With touch sensitive key surfaces, the proposed keyboard can detect finger gestures like taps and swipes in much the same way as a MacBook's touchpad. Applying these multitouch events to a computer's user interface yields cursor input functionality normally assigned to a touchpad device. For example, users can point, click, scroll, drag, select, zoom, and more simply by moving their fingers over an array of touch sensitive keys. Importantly, input from each of the user's hands is processed individually, meaning one hand can enter text data via key depression, while the other manages cursor control through touch events, or vice versa. Further, the system allows users to simultaneously type and move an onscreen cursor or perform touch gestures. Unlike existing MacBook or standalone keyboard accessories, which employ one-position dome switch or membrane switch type mechanisms, the fusion keyboard's mechanical keys feature two-position switches that output signals at different depression depths. In one embodiment, pressing a key down to a first level results in a conventional text output signal, but depressing the same key to a second level generates a different command signal, like a mouse click. On the hardware side, the tactile key press experience is accomplished via a double-dome switch or membrane setup with two or more detents. The document describes a variety of time-based processing techniques meant to discern intended touch input from physical key depressions. As an example, a touch input may be logged if the system detects a touch event at key "F" without receiving a corresponding keystroke within a predetermined time. If the processor logs a touch event and a key depression, it recognizes the input as a keystroke and outputs text accordingly. Apple goes on to describe other key input determination methods in more detail. 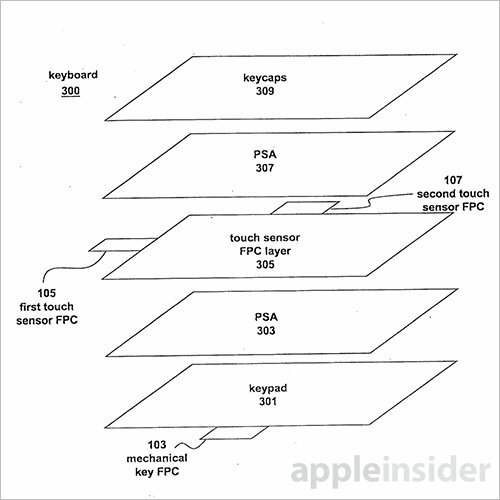 As with any Apple patent, it's unclear whether the fusion keyboard concept will make its way into a shipping product. With ever-shrinking MacBook designs like the 12-inch MacBook with Retina display, however, the company could do well to implement such a solution to cut down on chassis size. Alternatively, the invention would be useful in a form factors reminiscent of early netbook PCs. Apple's fusion keyboard patent was first filed for in September 2011 and credits John Greer Elias and Steven J. Martisauskas as its inventors.